One of the - ancient settlements of native coast is the town of Pomorie. Located 20 km from the town of Bourgas and 18 km from the ancient town of Nessebar, Pomorie will surprise you with its rich history and architectural monuments. The city is located on a small peninsula, surrounded on three sides by water, just west of Pomorie has access to land. In ancient history has repeatedly changed location, experienced a hostile attacks, storms, floods, fires. The present name of the ancient city Anchialo worn by 14.08.1934, when it was renamed the Special Ministerial Order of Pomorie. Architectural Reserve "Old Pomorie Houses" is one of the most - impressive and interesting monuments preserved here. You'll find them in the eastern part of the old town, next to the beach. The buildings represent specific elements and architecture of the houses on the beach, built in XIX c., During the Renaissance. Ensemble consists of ten houses, separated by narrow cobblestone streets, carrying the scent of sea salt and more. 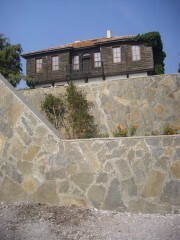 Pomorie typical house is two-storey building with stone ground. In the basement were located business premises, warehouse and kitchen. In warehouses were saved wine and dried fish - goods production which Pomorie is known today. The outer gates of the houses were wide to allow commercial vehicles with goods to get there easily warehouses. To the upper floor leads wooden staircase. He was a covering of pine and pine planks arranged horizontally. Boards protected the house from harsh sea climate spirals moisture and retain heat inside buildings. Intercom Pomorie homes did not differ much from other Bulgarian houses - entering through the door on the second floor get into the gym, around which are arranged rooms and ballroom niches, each with a very specific function. In the houses of - wealthy Pomorians walls and ceilings of the rooms have been artfully decorated by Renaissance masters. If you visit Pomorie, you can see the houses outside and walk the cobblestone streets of the old town. Unfortunately, the houses in the reserve are privately owned and can not be visited. If you want to see what they looked like inside, you can see the exposure of the Historical Museum in Pomorie, which recreates the precise arrangement of the old Anchialo homes. You will learn a lot about the life and livelihood of the local people will become familiar with their daily life and immerse yourself in the atmosphere of old Anchialo.